Have been thinking about songs lately. What makes some good, and what makes some truly outstanding: The kind that sticks in your mind long after your ears are unplugged, and you’ve exited iTunes. 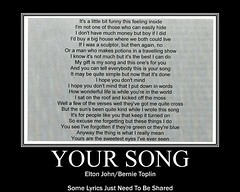 Sir Elton John’s Your Song is a good example. He’s not at all popular in my set. But it was used to great effect in Baz Luhrmann’sMoulin Rouge. Don’t you think that Ewan McGregor’s interpretation of Your Song holds a lot more optimism and youthful vigor than the great Elton’s? I’m so proud of Obi-Wan. I’ve discovered that on many levels, songwriting is akin to prose writing. First off, there’s the quality aspect. You can churn out a catchy melody and simple rhyme in no time, just like someone else could a simple holiday description for consumption on Facebook. No need for refinement, a little more thought, or editing out the clutter. The curse of Facebook is that we are all now very good at writing postcards of our lives. Or you could start crafting. Good, simple writing takes lots and lots of practice, training the mind’s ear to hear meter and rhyme in the simplest sentence and then, to do likewise. Writing prose is about clarifying thoughts, opinions, and ideas so the reader can follow and *stay* interested in what you have to say. It takes a great deal of reading to discover new ways of saying things, describing things, drawing images in the mind’s eye, images that the reader will be captivated by and which then become his own. I don’t own the words I write, not really. It’s always about giving them away. One can take days, months, to hammer out a song, much like silversmiths gently and expertly hammer out the silver to be fashioned into delicate things of beauty. I’ve been working on a song these past few months. And the process has been—painful. You search for the perfect sound, the perfect chord, the progressions, to match the mood you have in your mind. You do countless rewrites, revising themes, phrases, words, in search of that elusive hook, until all these things condense from a cloud of stars and comets into something almost physical and palpable. Yes, it’s much like the creation of a being, really. A song has a body, and a personality of its own, and it has, most definitely, a soul. You know the song has come to fruition, like an unspoken dream, or the birth of a star, when not a single lyric or chord can be taken away or added to the whole. The composition “Wonderful” is as much a gift to those who will eventually hear it as it is a gift to me from the Father of heavenly lights and who surrounds me with His songs of deliverance. Back to songwriting. There’s no way I could have done this all on my own. I’m not a craftsman in the field of music. Not by a long shot. But I saw how a rough-hewn stone of a composition could with time, patience, perseverance, and in collaboration with a master craftsman, be chiselled and scuplted into a thing of beauty, a joy forever, luminescent from within; the touch of the Holy Spirit. A pebble that once, perhaps, might even have been a falling star.